Kang Min Ho (Jung Kyung Ho) is a cold, ruthless businessman working for Gold Partners, a major bond investment firm. He has an axe to grind against the company Hermia Group. His philanthropic father was once Hermia's CEO, but he was charged with embezzlement after his death, leading to Kang Min Ho's mother committing suicide and all their family shares were transferred to Kang Hyun Chul (Park Yeung Gyu), Kang Min Ho’s uncle who now runs the company. As he butts heads with his uncle, Kang Min Ho comes across Kim Soon Jung (Kim So Yun), the daughter of his father's former secretary and who now, works at Hermia as Chairman Kang's executive assistant. Soon Jung is happily engaged to Ma Dong Wook (Jin Goo), a detective. Dong Wook dies in an apparent hit-and-run and in a strange twist of fate, Kang Min Ho becomes the recipient of his heart and makes a full recovery. 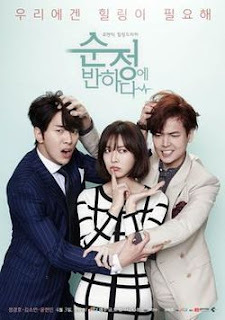 However, Kang Min Ho begins to exhibit different personality traits and habits, ones similar to the deceased Dong Wook's, and finds himself falling for Soon Jung. I have to admit, I love this drama. In the beginning, I was very hesitant about it, I mean c’mon… A heart transplant and then loving the same person, even changing the personality. I was very sure it would be a huge failure, and yet… and yet… I just couldn’t stop watching it. I just couldn’t take my eyes off the main couple, I seriously finished the whole thing in three days and then just laid around the house hating myself. However, a few days later I got over it somehow I started thinking realistically about this drama. There was a lot of good stuff in it, but also some issues that was forgotten in the drama. A lot of stuff wasn’t properly addressed or explained, so it kind of leaves you with a big question mark. This drama is a good example of how a bad, or at least skeevy, plot can be saved by excellent pacing and acting. The acting by Jung Kyung Ho was remarkable. Without him, this drama really doesn’t work at all. Kim so Yeon handles her role admirably, but without him it would have been unwatchable. A character that, by rights, I should completely despise. He really is a badass, but Jung Kyung Ho makes everything he does mesmerizing. Every time he was on screen, I was enthralled. So yeah, beside the questionable plot I really do recommend this drama.